Dome hotel is located on the edge of Mediterranean Sea. Its look depicts the 70 year history and it reflects a "Touch of Glass". It is situated exactly at the heart of Kyrenia town and this offers an elegant view through its sea side and between the mountains. This hotel is just five minutes from the Kyrenia harbor. 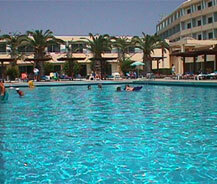 The hotel has three swimming pools for the guests. First one is a seafront seawater pool which is built by the natural rocks and the second is a fresh water pool and finally a children's pool because nowadays children's are willing to swim a lot. A good comfortable lounge is available in this hotel with an attractive bar and they offer different kind of drinks. This bar is all time engaged with live music and entertainment which makes the people to stay here for long time. The rooms are 157 in number in that 154 rooms are standard ones whereas the other 3 were suites. All standard rooms contains satellite TV, mini bar, dryers, air conditioning/ heating, telephone lines in rooms and in bathrooms, shower, and safe boxes. In the case of suites it holds a kettle which makes it very special. Also they offer service in a good manner which satisfies all the guests hence many guests are approaching them in holidays in a regular manner.